I wrote a custom method to check certain attributes and prerequisites and I'm giving couple of arguments with values but when I submit the documents through this Lifecycle, method does trigger but it's not able to read these arguments which I'm passing. I cleared JMS cache, D2 app server cache and restarted docbase with no luck. Is there anything that I'm missing ? Is it so that during the entry validation checks arguments with $value(r_object_id) is not passed ? Hope to find some answers. D2 version is 4.5 running on 7.3 CS. This is something new to me and it'd be great if you let me know which libraries are necessary for ID2Method to implement ? I found the d2-API.jar which is necessary for it. 'ArgumentParser' is in 'C6-Common-4.7.0.jar', which is located at 'webapps\D2\WEB-INF\lib' as stated above. By the way, what is the return value that's expected from this method ? I implemented this method and deployed it for the lifecycle. Even though the transition seem to be carried forward, I don't see any messages that I had written as system.out.println in the method in JMS log. And even though the condition is not met, I don't see the failed message. You should remote debug the code to see if it is being executed and working as expected. 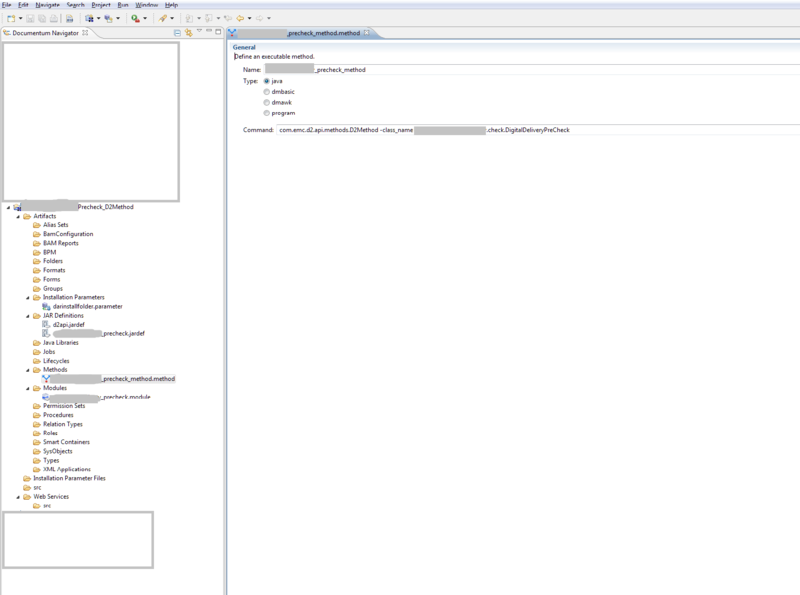 ERROR [default task-18] com.documentum.mthdservlet.DoMethod - Exception invoking com.emc.d2.api.methods.D2Method. I'm now doubting the way I deployed this method using Composer, as when I add this JAR definition and necessary module, when I tried to add the class name it complained about missing D2 API interface, as such I had to add D2-API to the JAR definition as well to be able to pick the class name. Is there a different procedure to deploy this kind of D2 methods ? But I always have deployed my methods in Module format and this is something new. I've done something like this and I used Eclipse (not composer) to develop method and I exported my method class in the form of JAR and then added it under JAR definition. By following your way, is it so that I've to write code right into Composer Class and then deploy it ? If you manage to deploy as a Module, let me know as I couldn't make it work either. Anyway, thank you for all the help and if you happen to find any way around for making it a module in future, please let me know.